Following several design meetings arranged by principal contractor Alpha Roofing, and involving the supply chain, estates manager and CDM coordinator, Metrotile Lightweight Roofing were chosen to supply both their stone coated steel roof tiles and a 10KW photovoltaic system that would be installed to feed energy back into the national grid. a durable, lightweight system that would offer a number of environmental and cost benefits for decades to come. 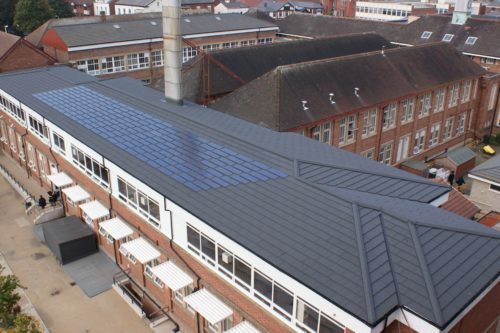 Given the strict time frame for completion, Metrotile were considered the ideal supplier; the photovoltaic panel is integrated into the profile, making installation as easy, and quick, as installing one of our standard roof tiles. This allowed for efficient planning at the design stage and resulted in the project being completed for the start of the new school term. For more information regarding Metrotile and education building projects, click here. For further information about Metrotile Lightweight Roofing, visit our contact page.To download from our library of informative documentation and certifications, click here.